Celebrate spring! Dress up and act in a play, dance around a May pole, make crafts, play games, plant seeds, eat food, buy crafts and rummage sale items, and more! All are welcome, lots of child-friendly activities. Admission: $3 per person; $10 per family. I spent most of April writing about wind turbines (which now seem not to be happening), and only covered two small pieces of the April Town Board meeting, discussing executive session issues related to the golf course and wind turbines. 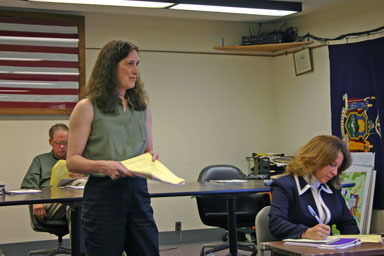 Carol McTague of the New York Department of Public Service came to talk with the Town Board about Time-Warner Cable's franchise agreement having been expired for 14 years. Rich Strong and Tom Doughney were also there. The discussion looked at what's changed in franchise law since the old agreement, and at the costs - about $2 million - of extending cable service to the entire town, if the town wanted to do that rather than accept the usual formula of 20 homes per mile. It didn't sound like the Town Board wanted to do that, but they did ask McTague to review the proposed franchise agreement, and will plan a public hearing in the near future. Dan Karig of the Conservation Board gave a brief rundown of progress on the Six Mile Creek Monitoring Project, which he felt had learned from the experience of similar volunteer monitoring groups like that monitoring Fall Creek. The U.S. Geological Survey will be helping with some aspects of the project. Later in the meeting, the Town Board approved the Six Mile Creek Monitoring Program's 2005 proposal, and appointed Timothy Woods and F. Robert Wesley to the Conservation board. Mike Talarski raised concerns about electrical inspection performed by Atlantic Inland at the new F & T Distributing building on Hanshaw Road, saying that while their inspector hadn't found problems, a different inspector, Floyd Ferris of Commonwealth Electric Inspection Service, documented 24 code violations, and then found another three later after the 24 were resolved. Zoning Officer Henry Slater said that he would look into the requirements the town can demand of electrical inspectors and their qualifications. Highway Superintendent Jack Bush reported that while this winter had been relatively mild and not required too much overtime for ploughing, the rains earlier this month had caused damage that would take about two weeks of work to repair. Blocked culverts caused many of the problems, and he asked that residents check their culverts. He also reported on spending a day in Albany meeting with legislators. County Legislator Martha Robertson reported on a variety of highway-related issues, including $75,000 to $100,000 of road damage from floods and work to come this year on Turkey Hill Road, Caswell Road, Midline Road, Game Farm Road, and Irish Settlement Road. She also discussed Cornell's ongoing survey for possible park-and-rides, including one near NYSEG. Councilman Chris Michaels seemed to think the idea would work better nearer the Ithaca Community Child Care Center on Warren Road. Councilman Mike Hattery asked Robertson how close they were to hiring a County Highway Manager, and Robertson said they were restarting the search. Robertson also thanked the Dryden Courier for its recent coverage of the Dryden Kitchen Cupboard. Recreation Coordinator Jennifer Staton handed out her monthly recreation report (92KB PDF) to the board, and spoke about the successful (200 participants) Dryden Band Showcase held April 8th. She also proposed a shift in location to Davelle Office Equipment until the new Town Hall is built, avoiding several moves in Dryden School District buildings. The board approved that, as well as some performer contracts and later a $500 salary bonus provided for in her original hiring contract. Town Attorney Mahlon Perkins reported that contracts were ready for Tompkins County and Cornell Cooperative Extension for Youth Services. He also said that an issue regarding trees along the new portion of Sapsucker Woods Road had been worked out with the Cornell Laboratory of Ornithology, and that the board would be voting to abandon the old portion of the road and accept the new portion in the near future. He had litigation and collective bargaining for executive session and reported briefly on progress in the Dryden Mutual Insurance annexation proposal and the Paul Simonet annexation proposal. 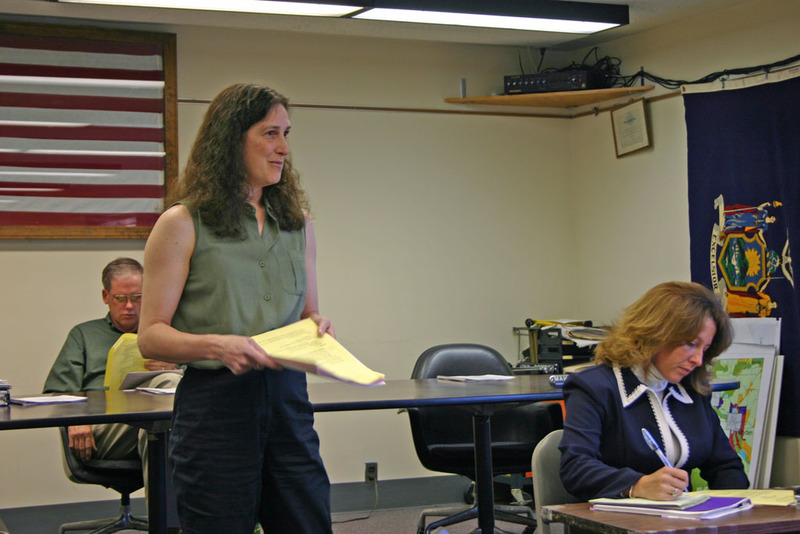 Environmental Planner Debbie Gross reported to the board about the Six Mile Creek Monitoring, and discussed the Planning Board's interest in talking with the Town Board, which they did on April 28th. She also discussed upcoming requirements for stormwater management laws, including a joint grant proposal with the county and other towns. She also reported on training for planning water and sewer systems, which she recommended to the board. Town Clerk Bambi Hollenbeck reported on talks between the SPCA and a number of towns to have them take over dog enumeration. The Town Board remains undecided about where to place the new Town Hall, and will be having a meeting about it on May 3rd, at 3:00pm with Egner Architects at the current Town Hall. There was also some discussion with Paul Simonet about sharing the costs of sewer for the new Town Hall with a planned development of his. There was also some discussion about a proposed recreation building near the new Town Hall, including bathrooms and storage, but no plans have been sorted out yet, and board members aren't sure how much money is available to build the Town Hall. Citizens living near the Game Farm Road and Ellis Hollow Road intersection have requested discussion of a water district there. Engineer Dave Putnam suggested it might be very expensive. Details were vague, but Town Justice Clauson has requested that a Village of Dryden Police Office attend Town Court sessions, at a likely cost of about $10,000, for which the Village might accept a trade of zoning officer services. Town Supervisor Steve Trumbull said he'd investigate and bring more information to the board. Town Councilman Michaels brought up the emergency services consultant the town had budgeted for, and said he'd write up a Request For Proposals to present at the next meeting. He emphasized that it would be for a consultant, not a permanent position, and targeted at needs assessment. 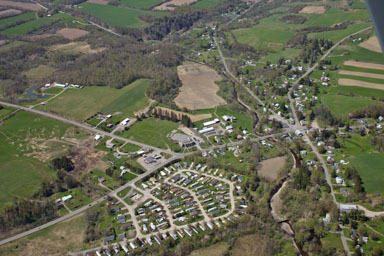 The Town Board's next regular meeting will be May 12th at 7:00pm at the Dryden Town Hall (map). The Zoning Board of Appeals will meet Tuesday, May 3rd10th, at 7:30pm. 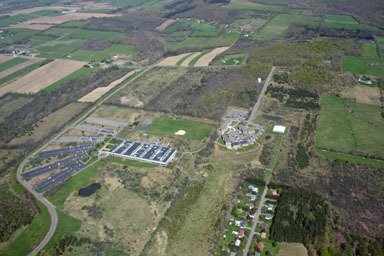 The Recreation Commission is meeting on Wednesday, May 9th at 6:00 pm, at the Red Dragon in Cortland (map), and then moving to Room A-307 in the Park Center at SUNY Cortland. The Conservation Board is meeting Tuesday, May 10th, at 7:30 pm. The Town Board is meeting at 7:00pm on Thursday, May 12th for their regular meeting, and has an additional meeting scheduled for May 4th at 3:00pm to meet with Egner Architects about siting of the new Town Hall. The Youth Commission will meet May 17th at 6:30pm. The Planning Board's May meeting isn't listed, but usually meets on the 3rd Thursday of the month, which would place it at 7:00 pm on Thursday, May 19th. This morning's Ithaca Journal brings sad news: two brothers went turkey hunting in Dryden and one died of a gunshot wound. Michael and James Carter of Clover, South Carolina were hunting yesterday along Mott Road, and Michael somehow shot James in the back. The DEC police are investigating, and Town Supervisor Steve Trumbull is quoted extensively in the article about proper turkey hunting procedure. A Dryden resident, Craig Evans of Ellis Hollow Road, is profiled among the six candidates for three Ithaca school board seats. Tompkins County will be having a special presentation on the proposed emergency communications network today at 4:30pm at the Old Jail (map). The March 2005 County Health Report lists a number of violations in Dryden, mostly in water systems. The Health Department will also be sponsoring a free rabies clinic on Thursday, May 12th from 7:00pm to 9:00pm at the Dryden Fire Hall (map). For voters in the Dryden School District, this year's official budget hearing will be on Monday, May 9, at 7 PM in Room C-13 in the MS/HS. The regular board meeting will follow (in C-13, not at Cassavant as originally published in the school calendar). A meet-the-candidates forum will be held Thursday, May 12, at 7 PM in the MS/HS auditorium. The budget vote/school board election is Tuesday, May 17, in the MS/HS auditorium. Polls will be open (in Dryden only) from 7 AM until 9 PM. Road construction costs, steep hills and potential other uses for the land led to the rejection of the other two suggested sites. One considered land use was recreation. Fields, equipment storage, nature trails and playgrounds were all mentioned as possibilities. After much, conversation turned back to the question at hand. "I really want to get you up to date with numbers because the one's you have are really old. The building has grown by several thousand square feet (since it was originally proposed). I want to get you those numbers so there aren't any surprises," Kingsbury said. County Legislator George Totman, who had earlier announced his run for re-election, was arrested for driving while intoxicated in McLean. 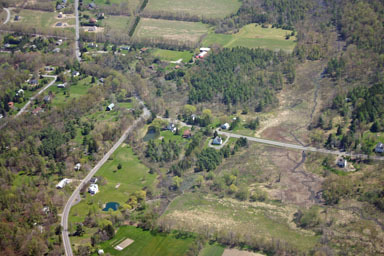 Totman represents the northeast corner of the Town of Dryden as well as the Town of Groton and the eastern edge of Lansing. Briefly in Tompkins notes that the Dryden Board of Education will be having a public budget meeting tonight at 7:30pm at Freeville Elementary School, a public hearing next Monday at 7:00pm in room C-13 of the Dryden Middle School/High School, and information sessions Tuesday at 7:30pm at Dryden Elementary School and Wednesday at 7:30pm at Cassavant Elementary School. It also mentions a Red Cross blood drive to be held Monday, May 16th, from 9:00am to 2:00pm at Dryden High School. Politicians love to hide behind increased assessments. Some will talk big about holding the tax rate steady, knowing all the time that increased assessments have been pulling more cash out of our bank accounts and pouring it into the government kitty every year. In Dryden last year, the town's tax rate stayed at 1.47, which sounds good, except that the levy increased 7.9%, from $846,000 to $914,000. The previous year, the rate was also 1.47, but an 8.5% levy increase happened then too. Assessments may affect the distribution of taxes, but it's the tax levy, not the rate, that affects how much we all pay in. A letter from Timothy Fahey of Dryden presents the contradiction between Cornell's claimed goals of attracting "the best and brightest students" and promoting sustainability, concluding that "Acknowledging this dilemma and engaging in dialog are the first steps needed to address it." This morning's Ithaca Journal reports that Gary Reid of Staten Island was indicted on two federal charges related to his contacting a Dryden Middle School seventh grader over the Internet and taking her away from school on April 15th. He was arrested with the girl at Pyramid Mall. Briefly in Tompkins notes that the SPCA's Dog Walk-a-thon fundraiser will be today at their Hanshaw Road facility (map). The front page articles of this week's Dryden Courier are devoted to teens. One explores the Dryden High School Senior All Night Extravaganza (SANE), an alcohol-free graduation night party which entices seniors to come with surprises. Even the location is a surprise. There's also a piece on honors received by Dryden Serteen Club President Luca Cerretani and advisor Laszlo Engel at a regional Serteen conference. On the opinion page, the Courier's editorial congratulates County Legislature Chair Tim Joseph for his recent efforts to be more open about the county's plans for an emergency communications network, and Dryden resident Leslie Cleland encourages voters to support the Dryden Central School District budget as well as incumbent board members. In Anecdotes and Brevities, Harry Weldon explores the other airport near Dryden, at Cortland, and Birds & Butterflies starts with a spring azure butterfly sighting in the McLean Bogs Preserve. The 4-H Fair will be July 28th to 30th this year, and the Dryden Sertoma Club will be having a golf tournament on May 20th. TC3 golf gets a feature in sports, as they made the list of the top 90 teams among junior colleges nationally. There are also photos of the Dryden Girls and Boys Track Teams, and a mention of a Dryden baseball loss to Trumansburg. After seeing some of the collectibles at last month's railfair, I went looking around eBay. I didn't find any stunning lanterns or other original memorabilia, but I did find (reasonably priced!) 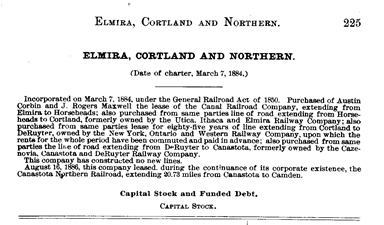 financial reports for the Elmira, Cortland, and Northern for 1891 and 1891. Sadly, they're ripped out of an old compendium of reports, but they're still a fascinating window into the past. 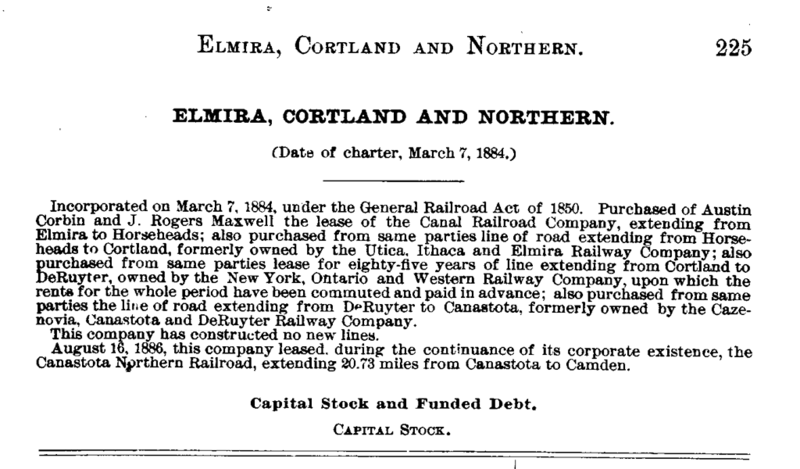 The Elmira, Cortland and Northern ran from Elmira to Camden, NY by way of Cortland. 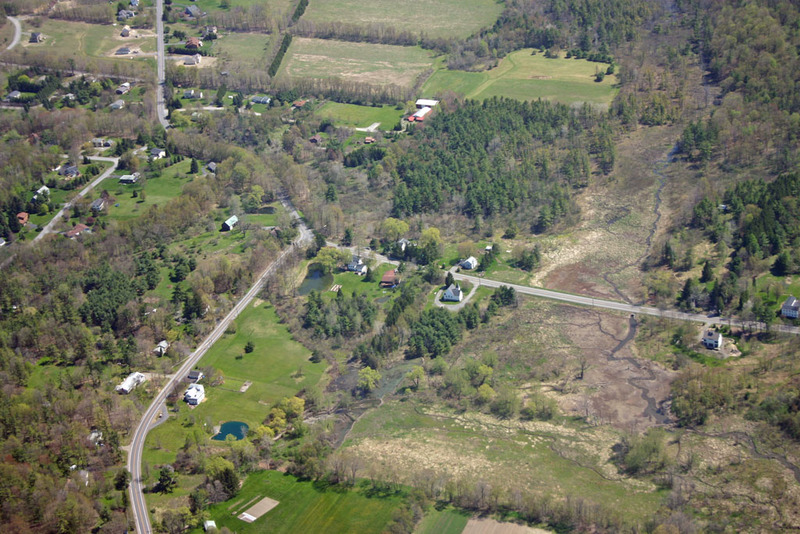 In the Town of Dryden, it ran from Game Farm Road opposite the present East Ithaca Recreation Way to Varna, Etna, Freeville (where it crossed the Southern Central), and McLean. In 1895 it became part of the Lehigh Valley Railroad, where it remained until the line's abandonment in the 1970s. I can't say I find most modern annual reports exciting reading, but there are some interesting pieces here, especially because the reports provide some detailed breakdowns of expenditures. A freight house at Freeville cost $673.33 in 1891, while a new boxcar built in 1892 cost $666.80. Operating expenses include things like "Repairs of bridges (including culverts and cattle-guards)," "Wages of conductors and men," "Damage to cattle and property," and "Telegraph maintenance and operation." The average rate for carrying passengers per mile in 1891 was 2.39¢, while the average rate for freight per mile was .75¢. Passenger traffic was heavily weighted toward local traffic, while freight traffic was heavily weighted toward through traffic. And what was all that freight traffic? The numbers for coal fall even more drastically than the drop in freight overall from 1891's 339,677 tons to 1892's 165,850. There isn't much information here about why, but it probably didn't make the railroad's owners - all 25 stockholders - very happy. It's also interesting to see that the two Ithaca members of the Board of Directors in 1891, Franklin C. Cornell and Frank J. Enz, disappear in 1892, when the entire Board is made of of downstate residents, plus one person in Greenwich, Connecticut and another in Philadelphia. The selectable versions aren't great, as the font and the age-darkened paper didn't lend themselves to clean optical character recognition, but they may still be useful. This morning's Ithaca Journal doesn't mention Dryden, but there's some county news worth watching. While Tompkins County will have one eventually, final approval for an Empire Zone may not come for another four years. Why? Each of the zones will be determined by economic need, and Tompkins County's healthy economy could mean a zone won't appear here for a few years. "It really favors the communities that prove they have greater economic need than the others," Stamm told the IDA. "It could put us in a bad position." While I recognize that there economic development to be done all over the state, it does seem like Empire Zones have been watered down to be a general business tax break program rather than the targeted improvements for the places most in need of help it was originally planned to be. I'll also be curious to see where in Tompkins County the Empire Zone acreage ends up, though it sounds like I'll be waiting a while. On the opinion page, Gannett columnist Jay Gallagher looks at the current stalemate over voting machines and suggests that dysfunction is alive and well in Albany. Also, today's paper opinion page seems to lack letters entirely, with two longer guest columns instead. I'm not sure what's up at the Journal, but they seem to be publishing a lot fewer letters generally. I can't say that seems like a good idea to me. This morning's Ithaca Journal has a brief notice that Dryden Middle School principal Roger Fedele resigned last night, after being on the job since last spring. Dryden Mutual Insurance is sponsoring a broad campaign to raise funds for the American Red Cross, as 19 groups try to raise $25,000. Tompkins Community Action will be sponsoring the Child and Adult Care Food program at Dryden Head Start and Dryden Union Street Head Start. A Freeville resident was arrested for DWI in Ithaca. In the Ithaca schools, the Journal asks all the school board candidates about the recent elementary school redistricting. At the county level, TCAT workers gave their bargaining team authorization to call a strike if negotiations in progress fail. Executive sessions -- Right now, lawmaking bodies can go into closed-door "executive sessions" for a small set of reasons. The problem is, there's no way to know if they stick to the narrow discussion once they're behind closed doors. There's also no way to find out what was said if the reason is later found to be bogus. Changing the law to require that executive sessions be recorded would solve both problems. If challenged in court, a judge can listen to the session in chambers. All those parts of the closed-door session not covered under the law can then be released by the judge for public review. As state law currently stands, there's no way to determine whether an executive session was used appropriately. Party caucuses, which the Journal also raises, are another tough problem, especially at the state legislature. And penalties for violations would certainly make it seem like the law was meant to be taken seriously. The Ithaca Journal reports this morning that Jason Kelly was sentenced to 90 days in jail and five years probation for a DWI last June that cost the lives of two friends riding in the car. Dryden Town Talk reports that the Dryden Grange honored Bob and Sue Cardwell "in recognition of their dedication to the Dryden community," and also honored the Dryden Hobby Club, founded in 1943. If you're hungry for chicken barbecue, you can find it on Friday from 4:00pm to 7:00pm at the Dryden VFW, as a fundraiser for the Student All-Night Extravaganza (SANE). There will also be a chicken barbecue on Saturday at noon at the Dryden Assemblies of God church (map) to raise funds for artist Tom Gordon to go to Denver for the national competition of the Fine Arts Festival of the Assemblies of God churches. Groton Town Talk reports that there will also be a barbecue in McLean on Saturday, starting at 11:00am at the McLean Fire Station, but the Fireman's Field Days will not happen this year. At the county level, the legislature is considering a 3% tax levy hike cap again, after trying last year and getting derailed by capital projects. There's also discussion of a proposed ban on burning plastics. At the state level, it looks like the decision of which voting machines to use may come down to the county level. I have to say I'm mystified that they'd do this, after decades of having the state on a single system. Hopefully we'll get through without too much chaos, but this seems like it has potential to create massive confusion, especially in statewide races or even in close Assembly, Senate, and Congressional races. The Journal's policy on including political announcements in our free Briefly in Tompkins community news section is simple: The event must be free and open to the public, or otherwise newsworthy. Announcements of political fund raisers, one-party solicitations for candidates or other internal party communications are not included in that free community space. The policy is applied to all political parties. I'd have thought political gatherings would qualifying under "otherwise newsworthy," but apparently the Journal wants its candidates to grow like mushrooms: in the dark. If you have a Dryden event, political or otherwise, I'll be happy to publicize it here. The Varna Community Center (map) will be hosting two Ithaca City School District-related events tonight and Friday. On Friday night, Ithaca City School Board candidates will be at the Varna Center for a "Meet the Candidates" session from 7:00pm to 9:00pm. Candidates Beth Kunz, Tom Frank, and Alan Lambert have said they'll be there, while Craig Evans can't make it. The Ithaca Journal's editorial today writes about the safety of hunting after a fatal turkey-hunting accident in Dryden. After looking at the steady decline in hunter injuries and the risks of other activities, it concludes that "In the end, short of hide under the bed, the only thing we can do is bring an educated caution with us into whatever form of recreation we choose." Much of the rest of the opinion page is filled with letter about the Ithaca school board race. Only one of those, so far as I can tell, is from a Dryden resident, Art Berkey. 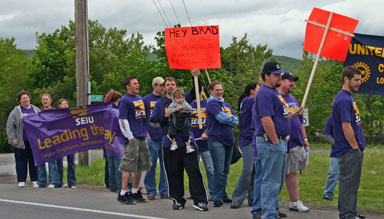 A Moravia man was arrested for DWI on Route 34B in Dryden, and for now, at least, it doesn't look like TCAT workers plan to strike. Some mornings, the news conveniently comes to my mailbox. I found this flier (61KB PDF) outside just now. Whether you agree or disagree with the perspectives here, I'm delighted to see people bringing candidates to the area and encouraging serious questioning. FIVE of the six candidates for the Ithaca City School District Board of Education have said they will appear. The greater the turnout, the greater the chance that newly elected Board members will take the concerns of Varna residents seriously. Varna has been re-assigned to Caroline Elementary School and is no longer in the Cayuga Heights Elementary School district. Caroline Elementary is 7+ miles fiom Varna. Cayuga Heights Elementary is 3 1/2 miles from Varna. The people of Varna had almost no input in this decision. Come express your views. Rising assessments and tax rates spell double digit increases in school taxes. Let the candidates know how tight our personal budgets are and why we cannot support large increases forever. The Board has had a poor record of communication with district citizens in the last year. The dissatisfaction with redistricting is an obvious symptom. This is an opportunity to question candidates about their commitment to communicating with Varna citizens. The candidates have very different backgrounds and experience with the Ithaca City School District. Listen to candidates tell us why they believe themselves to be best qualified and experienced for election to the board. Please consider coming out to speak with the candidates about these and any other issue that concerns you. Organized by residents of Varna, Pat and Tom Brenna <jtb4@cornell.edu>, and the Varna Community Association. While the Ithaca Journal may not have any interest in encouraging political activity by publicizing party events, they apparently do want to make sure that prospective candidates have some idea what's involved in running for local office, with an article briefly explaining the petition and caucus processes. If you're interested in running for office in Dryden this year, contact me if you'd like to run as a Democrat, Tom Hatfield if you'd like to run as a Republican, and the Board of Elections if you'd like to run as an independent. The Town Supervisor, two Town Board members, Highway Superintendent, and county legislators are up for election this year here. Also on schools, the opinion page has many writers from Dryden, but most of them don't seem to be identified as from Dryden. School board member David Lee is among the signers of a piece from the board supporting the proposed budget, while former board member Henry Kramer complains that the budget increases spending 6.3%. Varna residents Patricia and Tom Brenna endorse Allen Lambert for the board. In the Dryden School District, Theresa Grau writes in support of Linnett Short for the school board. Also on the opinion page, the director of the County Office for the Aging, Irene Stein, writes with stories of how older residents of the area are making a difference, and mentions John Ferger of Dryden Family Medicine, who passed away February 12th after a rich life, active to the end. I'm happy to see that the Democrats have a promising candidate for DA, Gwen Wilkinson, who announced her candidacy yesterday. The occasional writings of the current District Attorney, George Dentes, are substantially responsible for getting me interested in local politics. (One of the earliest Living in Dryden entries was on drug courts, actually.) While DA is a countywide position, I suspect that that we'll see a good deal of campaigning in Dryden. County Legislator George Totman, who represents the McLean area of Dryden as well as Groton and a part of Lansing, has entered an alcohol rehabilitation program. Jim Whipple of Specialty Trophies and Awards gets a laurel today "for his special act of kindness on the eve of our son's deployment to Afghanistan" from the Jarrow family of Ithaca. The print version of the Journal includes a letter from Dryden School Board candidate Brad Rauch, opening himself to questions from the public from 7:00pm to 10:00pm on Sunday, May 15th, at 844-8357. He sent me his reponses to a questionnaire from the Dryden Courier (18KB PDF) if you'd like to learn more before calling. This week's Dryden Courier starts with the Dryden High School prom, and then spends a lot of time looking at the school district. The article looks at both this year's James Bond-themed prom and parents' memories of the proms of the past. There's an article reviewing the Dryden schools budget, and there's a question and answer piece with candidates for the school board elections to be held Tuesday. (As I noted yesterday, Brad Rauch's answers (18KB PDF) didn't make the paper but are available here. There's also an article on the Dryden Youth Opportunity Fund, which handed out grants to local organizations this month. In sports, there's an article on the Groton Invitational for track, noting the successful performance of the Dryden boys team, and a picture of the Dryden Varsity Baseball team. It's a quiet Monday for Dryden in the Ithaca Journal. An empty house burned in McLean Sunday morning, a Freeville man was arrested for DWI in Groton, and the Journal's editorial looks at the inequities of property taxes, asking "what can be done?" This morning's Ithaca Journal has both an article and an editorial on the elections today for school boards and school budgets. In the Dryden school district, four incumbents (Rachel Dickinson, Chris Gibbons, Karin LaMotte, Amanda Kittelberger) and two newcomers (Brad Rauch and Linnett Short) are vying for four seats. The budget up for a vote is $26.69 million, which includes a 7% budget increase and a less than 9% tax levy increase. In the Ithaca School district, six newcomers (Tom Clavel, Allen Lambert, Craig Evans, Tom Frank, Beth Kunz, Seth Peacock) are running for three seats. The budget up for a vote is $82.76 million, which includes a 6.28% budget increase and a 4.32% tax levy increase. Voting for the Dryden Central School District is from 7:00am to 9:00pm at the Middle School/High School auditorium. If you live in election district 1 or 5 (meaning you normally vote at Etna Fire Station), the parts of the Ithaca district east of Baker Hill Road, you vote at Northeast Elementary School (map). Thanks to Jane Marie Law for that detailed breakdown. Not sure what school district or election district you're in? This map (1.97MB PDF, alas) may help with school districts. The similar map for Ithaca School District election districts seems to be out of date, so it's probably best to look at the election district map for the town (598KB PDF) and correlate your district with the voting places given above. One of the informational highlights of last Thursday's Town Board meeting was SUNY Cortland Associate Professor Sharon Todd's presentation on the preliminary results of the survey about Dryden recreation (133KB PDF, or 346KB selectable) that SUNY Cortland has been performing. Professor Sharon Todd of SUNY Cortland presents the preliminary results of the recreation survey. The preliminary report reflects 381 responses to a telephone survey (788KB PDF) plus a six-person older adults focus group and a two-person younger adults focus group. I've also posted the information sheet (73KB PDF) they used to answer questions respondents asked, and the focus group script (242KB PDF). Professor Todd will be compiling the final report over the summer, so there will be more details to take in and ponder eventually. This morning's Ithaca Journal reports that both the Dryden Central School District and Ithaca City School District budgets passed, Dryden's by a 916-678 vote and Ithaca's by a 2032-1481 vote. All of the propositions for both districts also passed. In the school board elections, despite a confusing table on the front page that only shows two winners in Dryden, incumbents Chris Gibbons, Amanda Kittelberger, and Karin LaMotte won three-year terms, while newcomer Brad Rauch won a one-year term. Current board President Rachel Dickinson and newcomer Linnett Short were defeated. In Ithaca, Tom Frank, Craig Evans, and Seth Peacock all won three-year terms, defeating Allen Lambert, Beth Kunz, and Tom Clavel. Boy Scout Troop 55 is building a canoe at the Ellis Hollow Community Center, using a single sheet of quarter-inch marine-grade plywood, epoxy, and lots of work. Briefly in Dryden notes that Sapsucker Woods Road will be closed today. Registration for Dairy Day ends May 20th, and the Historical Society will be having a presentation on Dairy Day (and electing officers) on May 26th at 7pm in the Dryden Fire Hall (map). Dryden Senior Citizens will also be meeting at the Fire Hall, but on Monday, May 23rd from 11:30am onward. Local residents Chris Xavier and Scott Weatherby will be discussing their experience in the 2004 tsunami. "This discussion needs to be about people... We have all heard from people in our district about taxes and assessments. It is because people are being roasted by municipal government. Do I, in my heart, believe we will end up at 0 percent? Probably not. But I believe we should start there." Lane and fellow Dryden legislator Martha Robertson both voted for the 0% goal. George Totman was absent. If you'd like to meet candidates for county legislature, Citizen Action will be holding the first of a series of meet the candidates forums tonight from 7:00pm to 9:00pm at the Greater Ithaca Activities Center (map). Dryden County Legislator Martha Robertson is included in tonight's round of candidates, as is Gwen Wilkinson, who is running for District Attorney. This morning's Ithaca Journal has an article on the latest test scores for fourth- and eighth-grade English released by the State Education Department. Across the state, fourth-graders are doing better while eighth-graders show little change. The article focuses on individual schools within the Ithaca district, and a sidebar provides overall district results. Ithaca's results on the fourth-grade test improved overall, going from 68% passing to 77% passing, but declined on the eighth-grade test, going from 67% passing to 58% passing. Dryden's results improved generally, with fourth-graders going from 59% passing to 68%, and eighth-graders going from 41% to 50%. Briefly in Tompkins lists two Dryden events. First, the Dryden Village and Town boards will be holding a joint meeting tonight at 7:30pm at Village Hall (map) to discuss the proposed Paul Simonet annexation along the eastern edge of the village. Also at the Village Hall, the Southworth Library will be having an Oprah's Book Club visit on May 20th at 7:00pm, with author Robert Morgan and his book Gap Creek . The entire Chiefs committee came to last Thursday's Dryden Town Board meeting to present a summary of status and to express concerns about a proposed emergency services consultant the board had been discussing since November. Neptune Hose Company Chief Ron Flynn presents fire issues to the Town Board while other chiefs listen. At the request of Councilman Stelick, we the Town of Dryden Chiefs Group collectively come before you this evening to provide a little history as to the Emergency Services within the Town of Dryden and to address the proposed Emergency Services Consultant position. In the past, there were attempts by our respective past chiefs to have the Town Chiefs meet on a regular basis, but for whatever reason, the meetings stopped and ceased to exist. 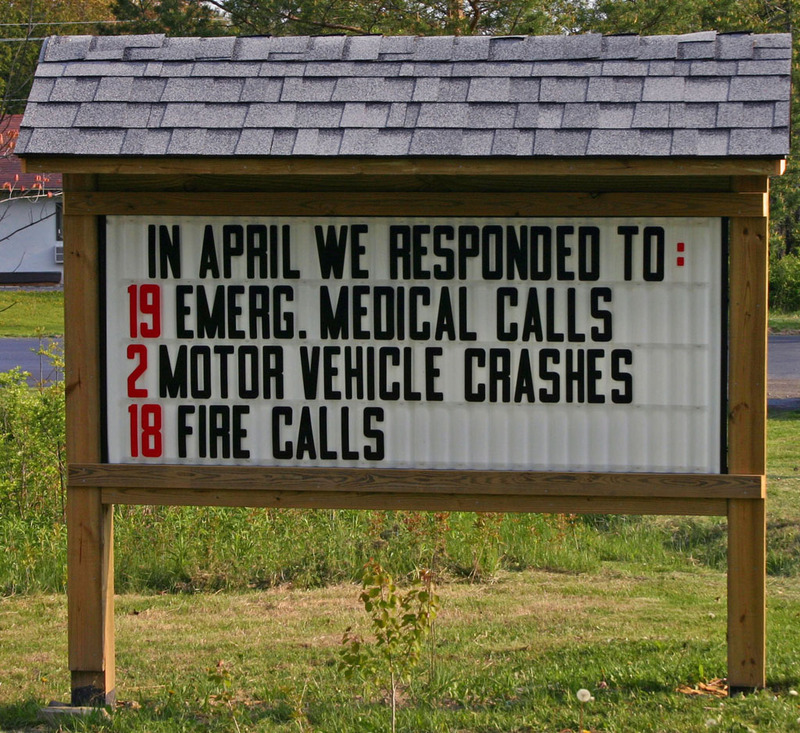 The interaction amongst the town departments unfortunately only occurred under the stress levels associated with a serious call. Approximately five years ago, the Chiefs once again started meeting in attempts to address common issues that plague each volunteer department within the town. Our meetings have dramatically evolved in five years, we have agendas, we take notes and in addition, we now have representation from Dryden Ambulance, Inc. and the Town Board. As we come before you this evening, we can honestly say that we have made great strides in addressing some of the major and common issues such as the declining number of volunteers available to answer the calls, Emergency Medical Services, OSHA Requirements, Standardization of Training and Certifications just to name a few. Although the declining number of volunteers in our ranks will unfortunately continue to be a major issue now and in the future, we have collectively worked out Automatic Mutual Aid Programs & Policies to share resources from one department to another. To address the Emergency Medical Services tiered response issues, through the collaborative effort rand leadership coming from Dryden Ambulance, Inc, the Town Board and the Town of Dryden Chiefs group, by the reallocation of resources, Dryden Ambulance, Inc. implemented the �Med-Car� Program to expedite the delivery of Pre-Hospital Care to community members at no additional costs to the tax payers. 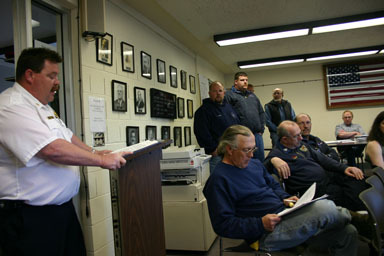 In addressing the OSHA Requirements specifically relating to the ability to wear Self Contained Breathing Apparatus, each department has agreed to use the Occumed Group, where twice and sometimes three times a year they come to a department within the town to conduct physicals to meet the minimum OSHA requirements. Standardization of Training and Certifications, through the chiefs meetings we realized that the standards used by each department to certify their Interior Firefighters was not consistent. In conjunction with the Occumed Physicals, together we developed a Standardized Interior SCBA Training and Certification Program and for the past two years, the town of Dryden Fire Departments have certified in excess of fifty firefighters annually all to the same minimum standard. In attempts to meet expectations from the town board relating to cost savings, departments have adopted a basic Turnout Gear Spec. and by doing so, we now have the ability to buy direct from a manufacturer at factory direct pricing reducing the cost to adequately equip each firefighter. As you can see by the progression of the town chiefs group, we have the capability of dealing with the issues. Combined, the town chiefs group has a wide range of knowledge, expertise and experience totaling over three hundred years of Emergency Service to our respective communities. Now that there is an open line of communication between the Town Board, and each department and agency, together we can attempt to overcome the issues. Collectively we are not in favor of the Emergency Services Consultant, we are your consultants! Together we can continue to maximize the utilization of resources, create and implement critically overdue programs such as the proposed Recruitment & Retention Program necessary to help combat the declining number of volunteers. Collaboratively we can ensure that as the town continues to grow, so do the Emergency Services. We have come a long way over the past five years by working together as a "team" or a "group" of dedicated individuals and by doing so we have become the envy of other departments on our accomplishments. The future indeed holds a lot of challenges for the Town of Dryden Emergency Services and it will take the collaborative effort of all of us to progress into the future. The Town Board responded, and there was some back and forth. Chief Flynn said that in the future, "a representative from a department will be here at each Town Board meeting to give you a briefing of where we are, and what we're doing." A couple of things that we would have looked to the consultant to provide for us that you haven't mentioned specifically would be - that I would like the chiefs to provide - a joint analysis of your budgets. We get a variety of budget formats. It is a constant concern on the board side is it the right amount of equipment and is it allocated correctly throughout the town. As we've educated ourselves and as I've looked at it, part of what's been explained to me is that when there is an event, there's almost always going to be a mutual response from a number of departments. You need so much water on site, and you need multiple departments' tankers to that effectively in a lot of locations in this rural environment. We're going from nothing to a group that's stepping up and saying "we can provide the advice you're looking for..." We were looking to the consultant to a more open-ended question, to provide us any recommendations they could make as far as equipment, what should we be budgeting for, that's already come out of a lot of discussion. And the communications discussion... there's obviously a lot with what the state and the county are going to do. There is an ample amount of resources within the Town. One thing that the Town Board needs to realize is through the chiefs' group, just because it's not painted a specific color, does not mean it cannot be used. The apparatus was bought by town taxpayers' money and it's there to be used for the town. I've been very happy with the program as far as the response from the Town of Dryden. It's not been without its problems. The problems, however, reside at the county dispatch level, not within the responding people. When we get dispatched, we go. It's very seldom that you're going to hear a second activation for someone to get to a scene within the Etna district. We're certainly willing, and capable of putting qualified trained people on the scenes quickly. Councilman Stelick commended the chiefs on their handling of the Etna response issue, saying "you stepped up to the plate; working together you guys have done an outstanding job." Councilman Mike Hattery then spoke, saying "I've been really encouraged since Steve's talked about what's been happening at the meetings... the cooperative effort." County Legislator Martha Robertson and Varna Fire Chief Natan Huffman talked about the county dispatch issues, and made plans to address them later. This morning's Journal has two stories on Dryden happenings, one upbeat, one more challenging. In upbeat news, Tompkins Cortland Community College graduated 557 students yesterday, 224 of whom live in Tompkins County. The State Senate and Assembly passed resolutions making May 21st Angelman Syndrome Awareness Day, and the article discusses Dryden residents Rob Hickey and Erin Sheldon efforts to increase awareness of their daughter Maggie's genetic disease, which is often misdiagnosed as epilepsy or cerebral palsy. Dryden is mentioned briefly in an article on a Lansing zoning issue involving a snowmobile test track, as the owner tests motorcycles on a track in the Town of Dryden. In broader news that affects Dryden, the county Environmental Management Council had a meeting on burn barrels, Cornell is studying the spread of coyotes and aggressive behavior, and sprawl and multiple levels of government may be hurting the upstate economy. 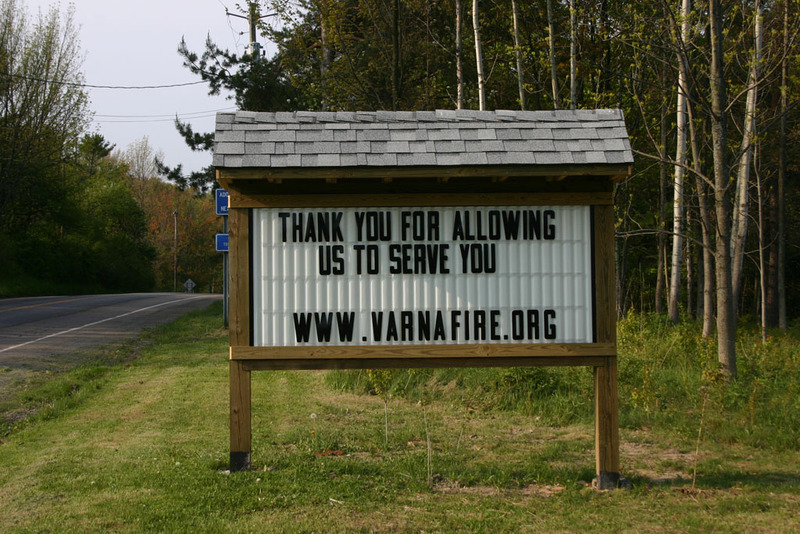 If you've driven Turkey Hill Road recently, you may have noticed that the Varna Volunteer Fire Company has a new sign up. 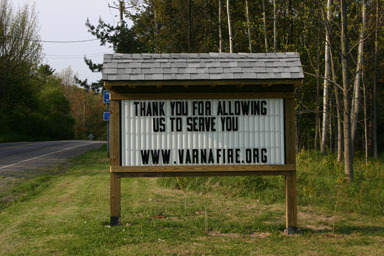 New Varna Volunteer Fire Company sign. 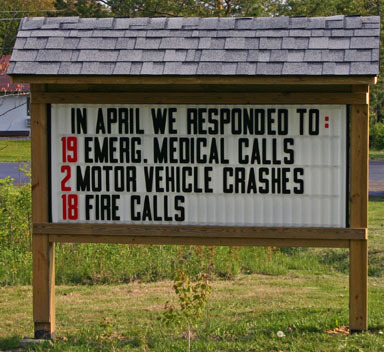 April calls for Varna Volunteer Fire Company. Two books I edited on mapping topics - Mapping Hacks and Web Mapping Illustrated - are coming out next month, so I've been wanting to play with maps. By combining district-by-district election data for the 2004 presidential race, the 2002 Tompkins County election districts map from CUGIR (produced by Tompkins County GIS), Microsoft Excel, some odd XML tricks, and MapServer, I managed to generate both a classic red/blue map and a purple map that shows more variation in how people in different districts voted. Red (Republican) vs. Blue (Democrat) in Tompkins County, 2004 Presidential Race. In the red/blue map, you can see which districts voted for Bush (Red) and which voted for Kerry (Blue). The Republicans clearly own the northeast and southwest edges of the county, but not much else. Switching to a more nuanced map, however, the pattern is somewhat less clear, especially in Dryden, where two districts - 3 in McLean for Bush, 9 in Ellis Hollow for Kerry - stand out from the rest. Red (Republican) fading into Blue (Democrat) in Tompkins County, 2004 Presidential Race. You can click on either map to see more detail and more labels. Also, there are some black spots in the City of Ithaca's purple map that seem to be phantom wards in the map. It sounds like election districts have changed slightly since the 2002 map data was published, so it doesn't quite line up with my other data. (When more recent data is available, I'll update the map.) There's no data for those areas, so they end up black, but they should really be blue given their location in Ithaca. I'll be doing more of these maps in the future, on voter registration and local races. These results aren't at all typical for Dryden, where Democrats turn out far more heavily for national races than for local ones, and I'll be looking more closely to see how these look for elections in off years. This morning's Journal, except for a DWI arrest, is pretty quiet about Dryden. Their editorial lays out the ground rules for letters to the editor, noting that the opinion page "is a forum for ideas - grand and absurd - and those ideas are filtered through a very small set of restrictions." In broader news, there's a piece on student accomplishments at Tompkins-Seneca-Tioga BOCES, as well as a look at what the US Airways-America West merger could mean for Tompkins County Airport. Historian Carol Kammen does something historians need to do on a regular basis, taking an idea that sounds good but isn't right and explaining where the story veers from the reality. She questions directional quilts, supposedly designed to help escaping slaves find their way north, and talks about the Underground Railroad in Ithaca and Ludlowville. After last night's 2004 presidential voting maps, I thought I'd play with the voter registration data and see what kind of perspective that gives on the politics of the county. As I did with the presidential data, I stripped it down to just two categories, Republican and Democrat, as it's hard to present more categories of data in these kinds of maps. The red/blue map shows a much redder county than the presidential results, with Republicans having more registered voters than Democrats in more districts than they won in the presidential race of Dryden, Lansing, and Newfield, as well as a district in Caroline. Red (Republican) vs. Blue (Democrat) Registrations in Tompkins County, May 2005. Red (Republican) fading into Blue (Democrat) in Tompkins County, May 2005 Voter Registration. I'm planning to do more of these maps, examining local races and changes in registration over time. There are a limited set of possibilities, but it seems to work pretty nicely. The Dryden Courier leads with an article on Dryden High School students placing at the New York Olympics of the Visual Arts. (The article is available online from the Ithaca Times.) There's a picture of students modeling a Louis XVI ball costume that took second place in Fashion Design, and an article inside that looks at the recent school board meeting, starting with the art contest. There's also an article on the recreation survey, which goes into greater depth than my earlier coverage on transportation issues and people's general lack of awareness of the existing recreation programs - the survey found that 37% of people it spoke with didn't know Dryden had a recreation department. There's a brief article on Dryden's school board and budget votes, which passed the budget but ousted board president Rachel Dickinson. Another school board member, Anderson Young, has been named a Distinguished Professor at SUNY Cortland. There's an article on classes Cornell Cooperative Extension is having for prospective farmers, starting next week with classes on equipment. The Courier's Etna-based photographer, Skip Thorne, won three awards at the New York Press Association convention, including one for a photo of a Dryden soccer game. In sports, there are photos of the Dryden girls and boys track teams, as well as an article on their performance at the IAC championship track meet, where the boys team beat Lansing while the girls came in second. It's another quiet weekend for Dryden in the Ithaca Journal. This morning there's a list of students honored at the May 19th BOCES recognition ceremony, including students from Dryden and Ithaca. There's also mention of state police safety checkpoints, including one on Route 366 in Ithaca this week from 9:00am to 3:00pm through Sunday. It's another quiet Dryden day in the Journal, except for a report on last night's Dryden School Board meeting. The board appointed Ted Walsh, who had been teaching English at the high school until he became assistant principal of the middle school last fall, to be middle school principal following Roger Fedele's resignation. Walsh will start June 30th. The board accepted Dryden High School assistant principal Larry Carr's retirement, and implemented personnel changes specified by the budget passed last Tuesday. As Daniel Armitage demonstrated last year, there's plenty of local interest in our old railroad history. Over the past few years, the DeWitt Historical Society (now the History Center) has published two excellent and very complementary books on the Lehigh Valley Railroad and its operations in this area. David Marcham's 1998 Lehigh Valley Memories looks closely at operations from 1941 to 1959 during the transition from steam to diesel, while Herbert Trice's 2004 The Gangly Country Cousin explores all of the many railroads that combined into the Lehigh Valley's Auburn Division, and what became of them. Marcham's Lehigh Valley Memories combines an excellent set of photos with explanations written by an enthusiast who went on to work for the Lehigh Valley, the Chesapeake & Ohio, the New York Central, and then the Metropolitan Boston Transit Authority. The pictures tell the story for much of the book, with detailed captions explaining exactly what's happening. While it doesn't focus on Dryden or Freeville, it shows a lot of what passed through here and gives an excellent explanation of how all of these intricate operations fit together. Trice's The Gangly Country Cousin takes a very different approach, though it also has lots of photos and maps. It stays off the Lehigh Valley's main line entirely and looking at the many branch lines from Elmira to Geneva to Fair Haven to Canastota and Sayre. It starts by looking at the creation of each of the branches, including the Southern Central through Freeville and Dryden and the Elmira, Cortland & Northern's transit from East Ithaca through Varna, Etna, Freeville, and McLean on its way to Cortland. After exploring the branches and their (often difficult) creation, debts of which often made them easy acquisitions for the Lehigh Valley, Trice takes a close look at particular kinds of cargo, including coal, milk, passengers, salt, ice, and grain. There's a chapter on train wrecks and a chapter on "The Men Who Did the Work," followed by a section on the decline and abandonment of many of these lines. There are two stops, one in each book, that I'd love to hear more about if anyone knows about them. The first is called Stevens Siding, and it appears in a map in Trice's book between East Ithaca and Varna. The second is Ludwig, listed in Marcham's book as somewhere between Varna and Etna, though closer to Varna. I'm happy to recommend both of these books. If you'd like to order either book, the History Center gift shop can help. Devontae Sims, a fourth-grade boy at Dryden Intermediate School, "was awarded Best Design honors by the National Education Association of New York in the kindergarten through fourth-grade division of the first ever Great Public Schools Art Contest," for a poster of the "perfect school." Coming right after high school students' success, it seems that Dryden is doing very well in art. Cathy Wakeman's Dryden Town Talk notes that Dairy Day is coming up, and that the Dryden Town Historical Society will be having a presentation on "20 Years of Dairy Day" on May 26th at 7:00pm in the Dryden Fire Hall (map). Wakeman offers a few of her own stories about Dairy Day in an article well worth a read. This year's Dairy Day will be June 11th. Registration for Dairy Day booths is still open. The Varna Volunteer Fire Company will be having a barbecue and car wash at their station on Turkey Hill Road (map) on Saturday, May 28th from 11:00am to 3:00pm. Dryden Senior Citizens will be meeting June 13th for lunch at the Dryden Fire Hall (map). Lunch is free to members and $6.50 to guests. Seating starts at 11:30am, and food at 12:15pm. Dryden creeks and changes to the land may be pouring silt into Cayuga Lake, as erosion and flooding take their toll and the building-over of wetlands, especially at the mouths of the creeks, reduce the normal processes that kept silt out of the lake. The Ithaca schools are seeing a spike in open enrollment requests after districting changes that included shifting Varna children to Caroline. At the county level, District Attorney George Dentes will run for a fifth term. He "does not plan any changes if elected to a fifth term." His opponent, Gwen Wilkinson, announced she was running a few weeks ago. Finally, the National Labor Relations Board dismissed four of five complaints against TCAT. The UAW plans to appeal. When I last visited SEIU Local 200United, they were just getting started with negotiations for George Junior Republic direct care workers and sounded optimistic. It doesn't seem to have worked out as well as they'd hoped. Today, SEIU Local 200United and its supporters held a rally today at George Junior Republic in advance of voting on management's "last and final" contract offer, which the union is encouraging its more than 200 members to reject. Union members emphasize family, living wage. The rally stretches along the road. "The unfairness of management�s offer is the low increases compounded by the agency�s demand that our members absorb an additional 5% of their health insurance premium,� said Keith. Under the current proposal, the average George Junior worker, currently earning $8.90 per hour, will be earning $9.10 and paying $69 per month for individual health insurance. "Add in the co-pay for dental and our average member is below the Tompkins County living wage," said Local 200United�s Chairman, Bob Lucas. "In fact, many of our members with families are at the poverty rate." Substandard wages and benefits translate into higher employee turnover. In turn, these direct-care workers aren�t able to develop sustained relationships with the agency�s clients, many of whom come to George Junior froin broken homes and otherwise dysfunctional families. The poster describes the union's position, emphasizing that they are not asking for authorization to strike, just a rejection of management's current proposal. Voting will take place at the Dryden VFW this afternoon and tomorrow morning. I've also posted a gallery of images from the rally. It's another quiet day for Dryden in the Ithaca Journal. The County Legislature approved spending $160,000 for repairs to the County Jail after a request by the New York State Commission of Correction, which had originally insisted the county build a much larger jail. County Legislator Martha Robertson was concerned that the appropriation was "reviewing the program backwards," because of the way the money came from unspent 2004 funds. 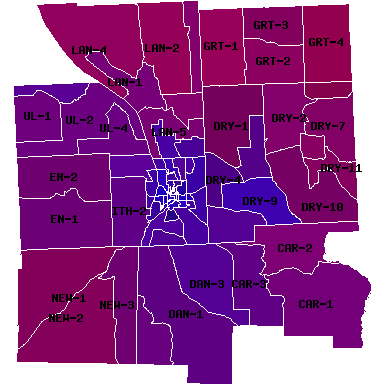 Also, while I haven't been reporting it daily, the latest jail census shows only one person boarded out. It's fluctuated a bit over the past few months, but so far the Correction Commission's revoking the waivers doesn't seem to have cost the county a tremendous amount of money for boarding out. That could, of course, change, but so far, so good. "We had over 100 members turn out for the rally and their determination to fight for a better contract carried over to the vote," said SEIU Local 200United Representative Mark Keith. "Only one member voted in favor of the contract." Approximately 80% of eligible voters turned out, Keith reported. You can read the full press release (89KB PDF) from SEIU for more information. This morning's Ithaca Journal reports on the status of labor negotiations at both George Junior Republic, where union members rejected a contract yesterday 118-1, and TCAT, where 'slow progress' is happening after workers authorized their negotiators to call for a strike. The article on George Junior offers more detail on proposed salaries and benefits than the TCAT one, though it's still a partial picture. A state trooper was involved in an accident at the western 13/366 intersection on Tuesday, and police are investigating. Campus News, Community News, and School News all chronicle the successes of Dryden residents in their lists of awards. This morning's Ithaca Journal includes a listing for the Dryden Memorial Day parade, which will start at 10:30am Monday on Main Street in the Village of Dryden. There's also an article on Cornell and sustainability, which I found interesting in part because it doesn't mention the now-cancelled windmills on Mount Pleasant. 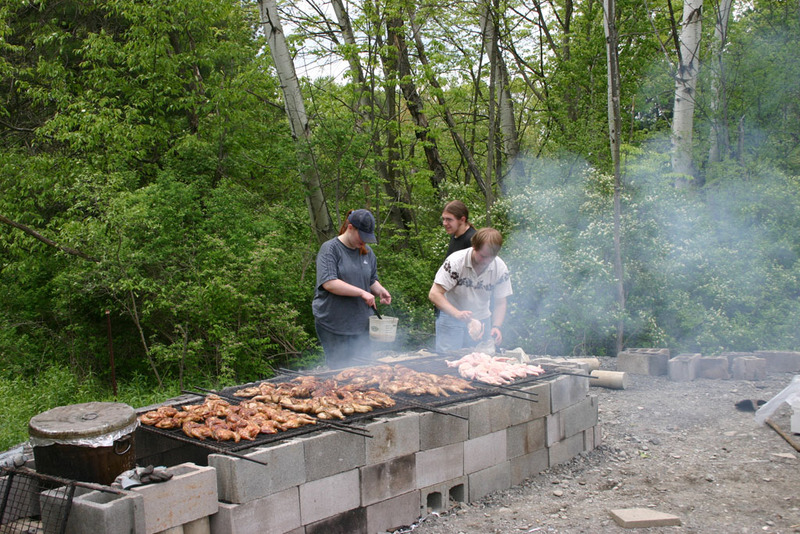 If you're lucky enough to be reading this before 3:00pm, or whenever they run out of chicken, the Varna Volunteer Fire Company is having a barbecue at their station. Barbecuing at the Varna Volunteer Fire Company. This barbecue is a fundraiser for Stars of Hope, a cancer research program of Regal Cinemas. They're also having a car wash at the same time. It's strange to see the station bays empty - and not on a call - but they have some seating inside. 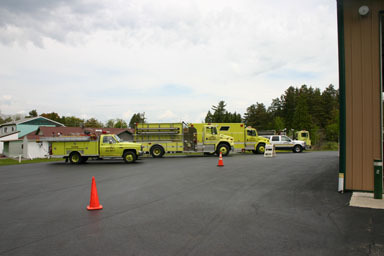 Fire trucks at the Varna Volunteer Fire Company. Chicken dinner is $7.00, and includes pasta salad, beans, and a roll. A chicken-half alone is $4.00. They also have excellent brownies for 50¢. Car washes are $3.00. This week's Dryden Courier takes a look at Dryden Superintendent Mark Crawford's first year. A few of the key points are the formalizing of the HANDS program, creating an after-school program at Cassavant Elementary School, and the recent passage of the budget on the first vote. Crawford is also holding regular meetings with the faculty and staff meetings, and starting a program of 20 minutes silent reading at the start of the school day. There's also a report on the hearing the Town and Village of Dryden boards held jointly last week, discussing the addition of a nine by three hundred foot parcel on the Village's eastern edge. It would bring a complete set of property Paul Simonet hopes to develop into the Village. It doesn't sound like it was very controversial. There's an article on TC3's new media classes, combining computers, video, and graphic design from web pages to DVD creation. There's also a report on awards handed out to TC3 faculty, staff, and students during commencement, and a discussion of the commencement address given by TC3 graduate Dr. Isaac Unah. In sports, there's an article on Dryden's Section IV Class B championship in both boys and girls track, as well as a piece on their first-round loss in the baseball sectional playoffs. There are two baseball photos from Dryden, one of Corey Hollenbeck and one of Josh Sterling. designated for the purpose of strewing with flowers or otherwise decorating the graves of comrades who died in defense of their country during the late rebellion, and whose bodies now lie in almost every city, village, and hamlet church-yard in the land. In this observance no form of ceremony is prescribed, but posts and comrades will in their own way arrange such fitting services and testimonials of respect as circumstances may permit. There's a list of closings for the day. Also, a Greene man was arrested last week for DWI on Route 13. It may have rained a bit this afternoon, but the weather this morning was perfect for a parade. I've posted a huge set of photos of the parade and the ceremony afterward, trying to capture something of the spirit of the event. 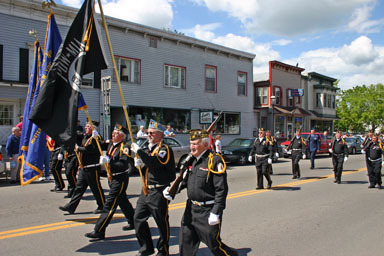 Veterans leading the Memorial Day Parade. 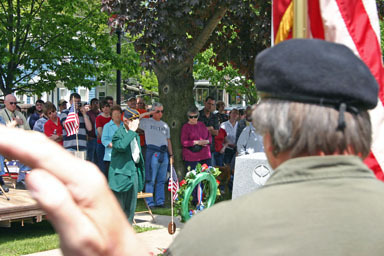 After the parade made its way down West Main Street to an enthusiastic crowd, there was a ceremony at the Village Green including music, introductions, speeches by Mayor Reba Taylor and John Bailey, salutes, and the placing of a wreath at the memorial at the base of the Village Green flagpole. Placing and saluting the wreath. I saw County Legislator Mike Lane this morning at the Memorial Day Parade, and remembered that I hadn't given his re-election announcement the kind of coverage I'd given fellow Legislator Martha Robertson's press conference, and it looks like I'll be writing another of these stories tomorrow for Mike's challenger, if WHCU's promise of "another Morning Report political declaration!!!" holds up. 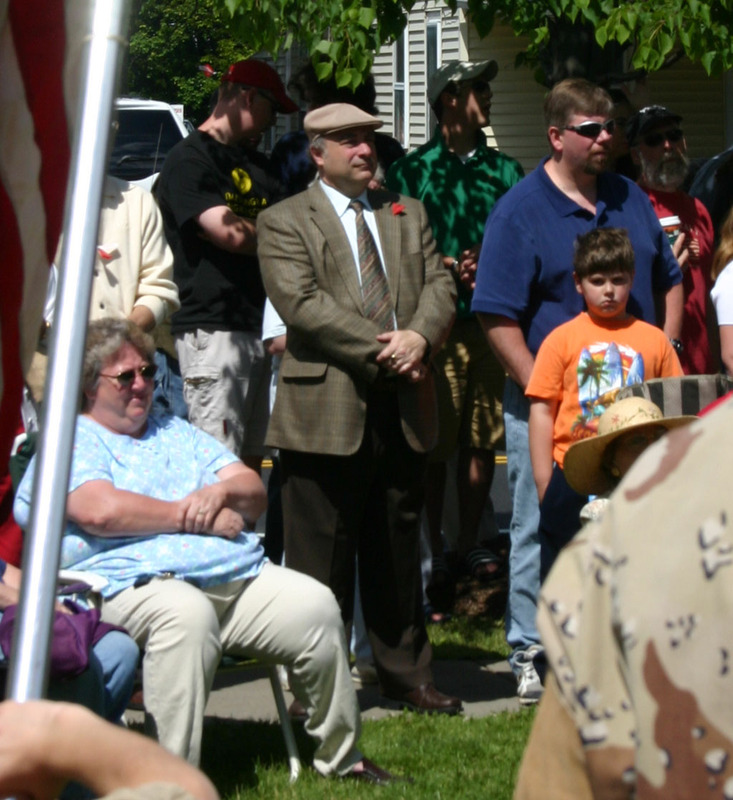 County Legislator Mike Lane attending today's Memorial Day ceremony. Mike has been a County Legislator since 1993, and is running for his fourth term. He's the Vice-Chair of the Legislature and Chairman of the Tompkins County Industrial Development Agency as well as the liaison with Tompkins-Cortland Community College. Looking beyond his recent accomplishments, Mike seems to know everyone in Dryden. He tells stories of his newspaper delivery days when many of the people he works with now were his customers, and has lived in the Village of Dryden for most of his life. He spent time on the Village Board of Trustees and as Mayor of the Village before moving to the County Legislature. If you'd like to hear what Mike has to say for himself, check out his press release on his re-election run (87KB PDF, 112KB PDF selectable). I don't think, given the subtitle on this web site, that it will come as any surprise to readers that I heartily endorse Mike in his run for re-election. As editor of this site, I've also been pleased with his ability to keep Dryden in the news by presenting strong and often dissenting views at the County Legislature, especially on spending and tax issues. It should be an interesting political year. 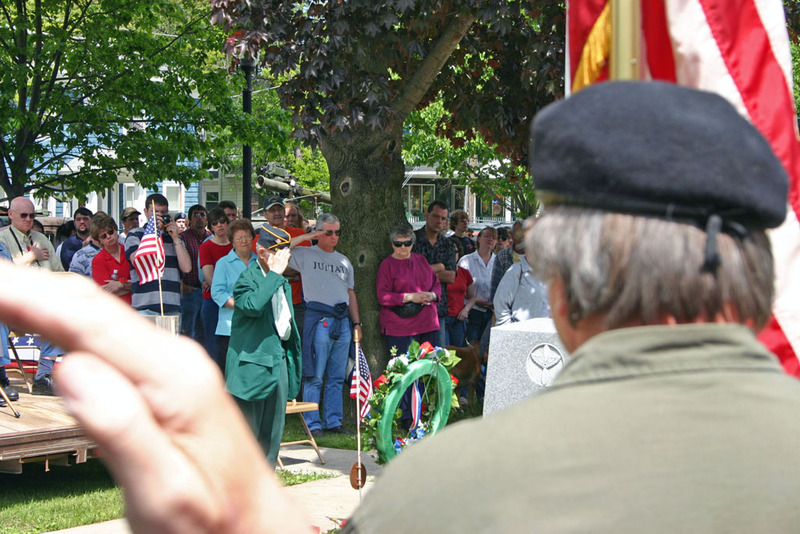 I'd noticed a photographer with a much larger camera rig than mine at yesterday's Memorial Day parade and ceremony in Dryden, and wondered if that meant the Ithaca Journal would be covering the event. Sure enough, there's a detailed article on the parade and ceremony in today's paper, which talks to participants and looks briefly at other area ceremonies. Briefly in Tompkins notes that the Tompkins County SPCA needs volunteer dogwalkers. On Casey Stevens' WHCU show this morning, Town Board member Mike Hattery announced his plans to run for the 14th legislative district, currently held by Mike Lane. The 14th district (map, 598KB PDF) includes most of eastern Dryden, the parts east of Caswell, Kirk, Mineah, and Midline Roads except for the area north of Malloryville Road. It includes the villages of Dryden and Freeville. Casey Stevens: Mike, what's up this morning? What do you have in mind? I received a press release from Mark Finkelstein but I should allow you to do it in your words. Mike: That's a good question... I think the main reason is, I think our area has a strong community heritage and I think it deserves faithful representation to the values of the community that I live in. I've gotten a real opportunity to work with and represent portions of that district so far. I was a Village Trustee for... 13 years... Deputy Mayor, worked a lot with Reba Taylor for a number of years, and Bob Day as Mayor before that. And then two years ago I ran for the Town Board. I've been in the area, obviously since Michael plays baseball I've worked with the Kiwanis baseball program, and we've lived in Dryden for 24 years. I think that over time I've gained an increase in concern for where we're headed as a county, and the degree to which the county is reflecting the values of the community I live in. I'm very proud and I'm glad that I live in the community I live in, I like the tradition values. Yesterday was kind of a banner day... It's a community where patriotism is not something we have to be ashamed of. We had our annual Memorial Day service. We attended afterward at the Memorial Home, I had the opportunity to talk with a World War II vet who was at the Battle of the Bulge, Bastogne, and it's just that kind of deep sense of a strong community ties, strong community values that we have in Dryden and I want to see those are faithfully represented in the County Legislature. Casey: What's your strongest asset coming into this race, Mike? You're up against an incumbent who has been there for a while, and who also has some state experience too. What's your greatest asset? Mike: ... I think that one of my major assets - I could talk about my professional experience, but I think that the most important aspect of anybody who works in local government is that you have a strong connect with the community you live in. We have, as I mentioned, years of experience on the board, and in those years I've worked with, it's got to be 15 different board members on the Village level, and I enjoy working it out with people. I enjoy the opportunity to find common ground, to make some progress for the people we represent. As I mentioned, I could talk about my professional experience. I've worked with the Cornell Local Government Program for about 25 years, 24 years, and worked with communities around the state, do education. Basically our mission is to improve and work with local governments on the things they need in New York. But I think my strongest asset is that I've been in the community and I've been serving as a local official, working with a lot of folks from different backgrounds over these last 14 years. There's a lot more conversation, which I'll try to transcribe over time. I'll also be asking for a copy of Mike's press release, which I'd like to post here. As Casey Stevens said near the end of the conversation, "Dryden has a fascinating contest about to begin." Update: More transcription in the continued story. Casey Stevens: You mention your job... Some say the legislature itself is a full-time job. What do you think of that? and has it occurred to your wife and family? Mike Hattery: Yeah, it's occurred to most everybody I've talked to. One of my concerns about the legislature, I mentioned that generally on the front end there, is that it's becoming a full-time endeavor. I think one of the things I want to see happen is to restore this legislature to a part time legislature. I think it's not a difficult stretch to think about this legislature becoming more of a policy-making body that sets broad direction and gets out of micro-managing a lot of areas that they currently seem to be delving into. Casey: There have been those charges that department heads have not been allowed to be department heads, but when you're talking about $103 million budget, $62-$63 million of it is generated locally, somebody's got to manage it. Does that mean you endorse a county executive? Mike: I don't directly endorse - I think the people ought to have a chance, citizens ought to have a chance to evalute that and vote on it. And I think the process for evaluating whether or not we go with a county executive ought to be a lot more open process. I think the current legislature's kind of sequestered their analysis of that. In my work, I've worked with both ... county executives and county managers, and I think part of it's personality, part of it's the person in the job and I think some people would argue, you know, if we throw open the seat of a county executive through a reform to our charter, that we're going to get a different pool of candidates coming out, and possibly somebody with a lot stronger administrative and leadership skills than we currently have, say, on our legislature. That could be. I tend to agree with the idea that it really depends on the skills and motivations of the person in the leadership role. Casey: ... Assessments. It has to be the number one priority. Even Mark Finkelstein and Barbara Blanchard, I said "Issues?" and they said "Taxes," in unison. Taxes, assessment - what's your story there? Mike: Taxes. I think... my track record is I've been somebody that's been very much able to work with other board members to maintain what I would call modest and livable increases in taxes while at the same time investing in new infrastructure. I think we've got to do something about the trajectory of taxes. Casey: Do you think 0% is doable? Mike: It all depends on what you mean 0% of. Casey: I was afraid you were going to ask me what I meant by doable. All right... we'll continue that one... Mike, we were talking taxes before we took the news break, and the issue is assessments, which have gone up from $20 million-some to $33 million in the past five years in Tompkins County. The tax rate has gone up 32% in the past five years. Hank Dullea has said cap assessments at 3% a year, your opponent Michael Lane has said perhaps we should assess every three years. I realize that you have time to come up with a policy and positions, but what is your thinking generally along these lines, about taxes and what the county's been doing. Mike: Assessment is not the same as spending. What drives tax rates up is spending. While some people get hit in very wild fluctuations in assessment - so I think the area we could consider something that's ameliorative, or would address drastic changes in those parcels or those properties that are undergoing drastic change. Because sometimes that, the market is pretty cruel to people. I think as long as state law requires that we assess at full value, we're not helping people by trying to hide what's happening with assessment. With the one proviso that I think some people can get really caught in rapid changes in the market that their house is in, and I think we have to think about what we're going to do in those circumstances. But generally speaking, it's spending that causes problems with the tax, property taxes - it isn't the assessments. We can have a rise in assessments - if we hold spending the same, our tax rate should go down and the bottom line about what you pay should be about the same, as long as your house isn't drastically increasing in value relative to others. So I think the spending side is the side that needs to be addressed, and I think going to some kind of three-year or multiple year is just going to give people a much harder hit in three years rather than a steady increase, if, in fact, we remain in this kind of environment where real estate values are rising. One of the things that we were talking about taxes earlier, you asked me if I thought 0% was possible. I'd say I hold out the possibility. One of the things I'm really concerned about is - and I faced this in at least one other local government that I stepped into - is where people were spending down surpluses and under-investing in needed infrastructure. That's just going to cost everybody a lot in the long run, if that's been taking place. And I think I know that there's been some modest - I would say very modest - attempt to redress what have been years of neglect on investment in our county highway infrastructure. I'd like to see what that that picture is really like. I want to see where our reserves are, I want to see where our abilities are to restore the needed investment there. You know, when you underinvest in roads, you're multiplying your needed investment in the future. When you maintain your roads adequately, there's kind of a lifecycle costing to them, if you don't do adequate maintenance, you're driving up taxes higher than they already are. Casey: Can we expect you to take on this issue of why, for the most part, some have blamed Albany continuously and constantly over the past four years, that some legislators have blamed Albany for the county's fiscal problems. Do you go along with that? Mike: Not solely. I think there are some very clear fiscal relationships that need to change between the state and localities. One of them is, as in Medicaid, where the state is able to both grant responsibility - put responsibility on localites while maintaining the authority for changing the rules and calling all the shots. I think if localities have the responsibility, they ought to have the authority and the revenue-raising capability to take care of it. On the other hand, given what other counties are doing, I don't think we can put the sole burden of the kind of trajectory of tax increases we have had in Tompkins County on state increases. Casey: Mike Hattery is running for the 14th district, the eastern half of the Town of Dryden, for the Tompkins County Legislature... A minute left, Mike, all yours - Mike Hattery. Mike: Thank you very much. And we haven't mentioned that my wonderful wife Debbie's in here with me... Michael and Debbie, my son and my wife, are, I have two older daughters as well, one 28, one 24, who are out of the area right now. But I brought them in because they've always been a big part of my efforts in serving the public, and a part of the team, so I wanted to have them with me here. I guess the other important thing, the reason why I try to keep Michael involved, is I think we need a massive effort to try to re-engage our younger people in local government in particular and interests in public affairs. I'm grappling with that and we've thought about some projects on the work side of my life. Casey: And we'll figure that out over the next couple of months. Mike will be a regular in match with Michael Lane, so that we can keep even here, so that Mike will be one of the regulars of the Morning Report over the next six months or so, and we thank you for coming in this morning. I can definitely agree with Mike that "we need a massive effort to try to re-engage our younger people in local government in particular and interests in public affairs," though I suspect we'd look at how to improve that situation pretty differently. 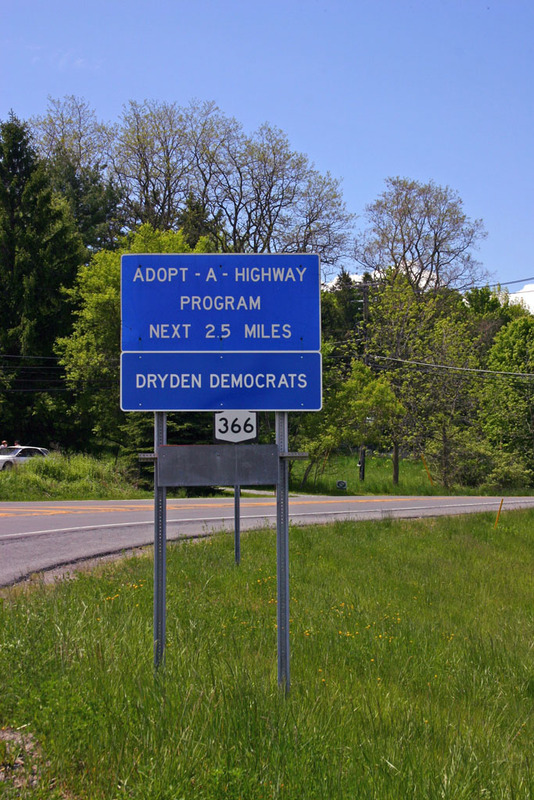 After the strong Democratic performance in last year's election, and with Democratic voter registration passing Republican registration in the Town last year (currently 2979 D - 2791 R), the Dryden Democrats wanted to do something to increase our visibility. We have a number of projects under way, but one just became visible this morning: we've adopted a highway. 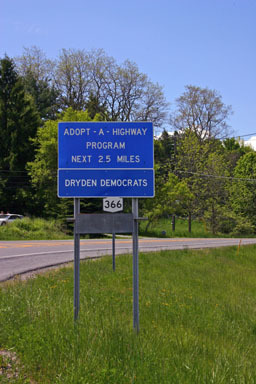 Dryden Democrats adopt a highway: Route 366 between Route 13 and Varna. Update: Since I posted that photo, the DOT realized that this stretch of highway is 1.5 miles long, and changed the sign accordingly. If anyone's curious how I made the presidential election and voter registration maps of Tompkins County, and doesn't mind a walk through some technical details, my employer's published Hacking Election Maps with XML and MapServer, which explains how I created them.